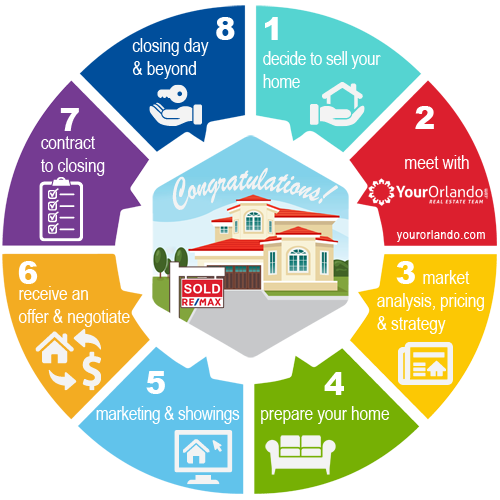 Are you selling a home in the Orlando area? On average American homeowners sell a home every five to seven years. With homeowners only facing a move every five years or so, it’s understandable why some are not comfortable with the home selling process. Our Team will simplify the home selling process by helping you price your house to sell on your schedule—and for the highest possible price. In addition, we will help you prepare your home for sale, provide world class marketing, stage and prepare for buyer showings, negotiate purchase offers and contracts, and help you plan your move to your new home. Okay, now that you have an overview of the Home Selling Process, let’s look at each step a little closer. GET MY HOUSE VALUE NOW! When choosing a real estate agent to list your home, you should consider interviewing two or three real estate agents from different brokerages. Before you interview the different agents, it’s a good practice to prepare a list of questions that are important to you. Doing so will allow you to better gauge who is more capable of meeting your home selling needs. Choose your agent wisely, and above all, choose an agent that you feel comfortable with. Your agent will help you sell one of the most valuable assets of your life, so find someone you think will do a good job! Since 92% of homebuyers search online for their new home, how will you leverage the internet to sell my home? How many years have you been in business, FULL TIME? Are you a professionally trained negotiator? What is the current market situation and how will it affect the sale of my home? What is your average days on market from list date to purchase contract? How will you keep me informed throughout the sale of my home? What do you charge (commission)? If I were to work with you, how would you market my home? How can you protect me from getting stuck in a contract with a buyer who is not properly qualified? If a problem comes up during the buyer’s home inspections, how will you handle it? If the buyer’s appraisal comes in low, how will you handle it? Can you give me the names and telephone numbers of other families who have used your services? The days of using newspaper ads and real estate magazines to sell your home is over. Nowadays homebuyers overwhelmingly chose the internet to find their new home. In fact, 92% of homebuyers now turn to the internet to locate suitable properties, according to the National Association of Realtors (NAR). If you are looking to sell a home in the Orlando area, it makes sense to hire Orlando’s #1 Online Real Estate Team. The market analysis is where we will take an in-depth look at the market data, paying close attention to the most current statistics, and the new competing properties that have come to market. Consider whether current, national, state, city, local, and neighborhood market conditions favor the buyer or seller. Consider that buyers will seek out the very best value. Your home must offer equal or greater value than the competing properties on the market, or it will likely not sell. Compare your home against similar properties that have recently sold in your neighborhood. Calculate the price per square foot using your comparable sales. Take the sale price of each home and divide it by its square feet of living space. This will give you the Price Per Sq Ft.
Make adjustments for the differences. Adjustments should not be made for minor items like carpet, paint, and other maintenance items. Normally adjustments are made for pools, additional rooms, like, bathrooms, garage spaces, bonus rooms, etc. Based on the market analysis and pricing established above, we will agree to the final points necessary to reach your selling goals and meet your desired sale date. When preparing your home for sale, you should look at your home from the potential buyer’s perspective. When the buyer drives into your driveway, what will they see? When they walk up to the front door, what will they see there? When they walk into the house, what will they see there and beyond? You should consider each step that a prospective buyer may take as they view your home. How does your home compare to the other homes they will see? We will never authorize an unscheduled visits to your home. If someone shows up unannounced or unplanned, DO NOT OPEN THE DOOR. Turn them away. Even with licensed real estate agents escorting qualified buyers through your home, there is no need to tempt anyone. Put away your jewelry and other valuables. While you are at it, you should also secure medication, important documents and other items of importance. You should contact your local police or sheriff’s department and ask them for their current safety tips & advice. They are your safety professionals. When in doubt, heed their advice. With your safety in mind, let’s show your home in a way that will make prospective buyers fall in love with it. It is always best if you are not there when a prospective buyer is viewing your home. The buyers need to feel comfortable viewing your home. If you are there they will feel as they are imposing on you. If you are there when they arrive, they will try to get out of your way as soon as possible. This is not what you want when you’re trying to sell your home. Let’s give the buyers the space they need to fall in love with your home. Nobody wants to buy a small house. Even the largest of homes can seem small if they are filled with clutter. Remember to keep spaces clean and clutter free. Clean, clean and clean. It makes a big difference. Think Buyer Safety — Remove tripping hazards, dogs, etc. While you’re waiting for the buyers to show, you should begin planning for your move. There’s a lot to consider before signing a purchase contract with a prospective buyer. Even if the purchase price is more than satisfactory, if the terms and conditions of the agreement are questionable, you might want to think twice before you sign. How close is the offer to the asking price? Will your home appraise at the asking price? Is the offer an as-is offer, or has the buyer asked you to make repairs or give a credit for improvements? What will be your net proceeds on the sale? How large is the earnest money deposit? What are the contingency periods? How will you handle it if no other offers come in? Knowing your closing cost and proceeds will help you make better decisions. You can use our Closing Costs & Proceeds estimation tool to help you estimate your costs and proceeds. When you sell a home, normally your buyer will take out a mortgage to pay for the property. Essentially, this means that a lending institution will be lending the buyer the funds necessary to purchase your home. For the protection of the lender’s collateral, the lender will require that the house be appraised to insure the property is worth the proposed purchase price, and to make the lender aware of any major problems with the property. Sellers should prepare themselves for the appraisal when selling their homes. There will be various professionals evaluating the price of the home at each point of the sale. Not least of which is the appraiser. Overpricing your home can cause various problems including a short appraisal, or for the house not to sell at all. Keep in mind, the appraisal is just an opinion of value. However, as the appraiser their value carries a lot of authority. Be on the alert for appraisal contingencies in the purchase offer. In most purchase offers, the appraiser’s value is important and meaningful, but normally does not require that the property be sold at the appraised value. Along with the inspections and appraisal, there will likely be several other contingencies that need to be cleared prior to closing of escrow. Make sure you are watching the timelines in your purchase contract closely. If you fail to meet a contingency defined in the contract, you could be in default. You should consult legal representation if you have concerns about your contractual obligations. CLOSING—the big day is here! So you have cleared the inspections and other contingencies. And you’re off to the closing to get that nice big check. Don’t forget to bring your driver’s license, passport, or other government issued identification. You will need to verify who you are to the closing agent. Prior to closing you should receive a Closing Disclosure which will provide you with what your costs and proceeds are expected to be on closing day. Once you have approved the Closing Disclosure, your final numbers at closing should match up on the final Settlement Statement. While at your closing, the title agent will go over and have you sign the Settlement Statement, Deed transfer, and other closing documents. Once all the documents are approved and signed by all parties, the closing can be funded for disbursement. You will have the option to receive a check at closing, or to have your funds wired directly into your account. Please make your choice known to your listing agent so they can help you make arrangements. Once you receive your funds, the sale of your home is finalized. Congratulations! So, you have decided to sell your home. Now the questions start to flood your mind. Don’t feel alone. Most people who decide to move face many of the same questions and fears. One of the biggest fears we hear from home sellers is, “How do I know when my house will sell? I see some houses sell quickly, but I see others sit on the market for a long time. With selling times varying so greatly, how can I make plans to move?” Believe it or not, it’s pretty simple. And you as the seller have a lot of control. We will show you how to sell your home on your schedule – and for top dollar. If you are ready to start the home selling process now, or you have a question about selling your home, you can contact us now. We are here for you. It might sound crazy, but do you realize that many real estate agents don’t have a formalized marketing plan for selling your home? Rest assured, we have a Home Selling Marketing Plan. If you have questions about our Home Selling Marketing Plan, or you want to learn more about the Home Selling Process, please feel free to contact us right now. We are here and ready to take your call.